Split over four (yes, FOUR) levels this highly impressive venue is only listed in our stats as 475 metres but when both are all bolted together for corporate events this becomes one of the largest indoor tracks in the UK. 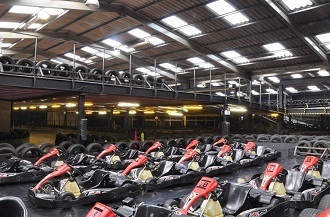 The circuit is located within easy reach of the Meadowhall centre and is a must-see for all those enthusiastic go karters eager for their latest thrill. From junction 34 of the M1 take the A6178 exit to Sheffield/Rotherham/Meadowhall. Continue on Shepcote Lane/A63. At the roundabout take the first exit to continue on Shepcote Lane for 1.2 miles then turn left on to Shepcote Way. Follow the road all the way to the end and round to the right, turn into Gate 1 of Tinsley Industrial Park, the track will be on your left.